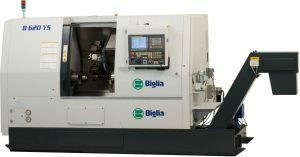 Since 1958 BIGLIA have produced more than 10,000 machines, of which about 5,500 are CNC-lathes. Reliability, accuracy and performance are assured by using state-of-the-art components, by monitoring manufacturing process closely and employing advanced production technology wherever appropriate. Since its foundation BIGLIA has been committed to design and manufacture high-quality, high-precision machines that guarantee our customers high flexibility. The modular concept and the high versatile options provide a wide spectrum of machining possibilities ranging from universal turning to complete machining of complex parts thanks to the CNC automatic tailstock, second spindle, rotary tools, spindle C-axis and Y-axis. The B620 is available in five versions with bar capacity of 51 or 70 mm. The SmartTurn S multipurpose five axes turn-mill centre represents the complete combination between a lathe and a machining centre. Optimum chip removal and accuracy thanks to the sturdy machine structure and the exceptional vibration damping. The new QUATTRO T3 range of machines equipped with three turrets and thirteen axes is the latest product developed by Biglia in the field of high-performance twin-spindle bar turning centres. The three turrets can perform simultaneous machining using three tools at the same time, thus reducing cycle time dramatically. The new QUATTRO T3 range comprises a wide range of alternative specifications and functions to enable flexible machining operations to be completed on a single machining centre. A wide range of customized configurations results in extremely efficient and flexible production of simple to complex parts using live tools, C-axis and Y-axis. Available in three configurations featuring 45 and 65 mm bar capacity. This model meets specific market requirements for bar machining in automatic turning: a twin-turret and twin-spindle CNC-lathe with fixed headstock, compact, versatile and quick for combined turning, milling and drilling of small-sized parts. A very compact structure offering optimum use of available space in the workshop (less than 5 sqm). The robust components such as the main bed, linear rails, turrets and spindles combined with powerful spindle motors (11 kW) and live tools (max. 4.6 kW) will allow you to achieve significant results.